Equal parts passion and ability, Allen Iverson wowed the league during his impressive career and earned the respect of collectors along the way, leading to significant interest in Allen Iverson rookie cards. Although he had plenty of ups and downs, and never claimed that elusive title, "The Answer" proved he was one of the greatest guards of his era. 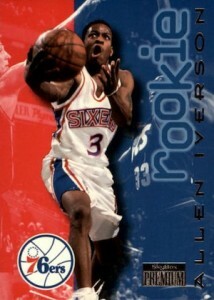 Take a look at all the official Allen Iverson rookie cards in the guide below. Relatively short for an NBA star at a listed height of 6'0" (and widely thought to be smaller than that), Iverson played for Georgetown University before making the jump to the NBA. Four teams and 11 All-Star nods later, AI officially retired in 2013. 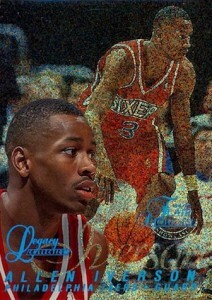 He also added an MVP Award in 2000-01 and was the Rookie of the Year in 1996-97. 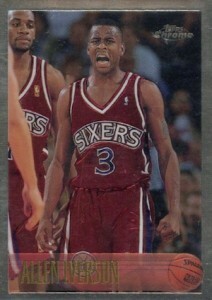 Shop for Allen Iverson Rookie Card listings on eBay. 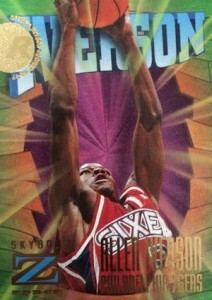 Like most key basketball names from the 1990s and 2000s, autographs and rookie cards command the most attention from collectors looking at the top Allen Iverson cards. These rookie cards make things a little more simple as there are just 16 main options. Found in 1996-97 products, Iverson is joined by Kobe Bryant, Steve Nash and Ray Allen, offering collectors a stacked rookie class. 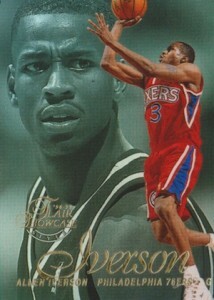 The following list highlights each of the official rookie cards for Allen Iverson. All are traditional base cards and most are very affordable. While parallels are noted when available, the many rookie-year inserts are not featured. Also not covered below, the early non-NBA cards for Iverson, including Press Pass, Score Board, and Collector's Edge, remain popular with collectors. Click on the images or main headings to shop for cards on eBay. When available, linked sets in the description go straight to detailed set profiles. 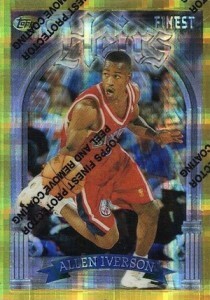 Featuring a large L-shaped frame and plenty of foil, 1996-97 Bowman's Best is a loud option for Allen Iverson rookie card collectors. Very susceptible to smudges, collectors can find limited Refractor and Atomic Refractor parallels. 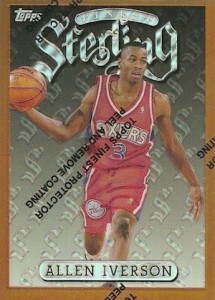 In addition to the main rookie card, there is also Retro subset card for Iverson with a black-and-white image. 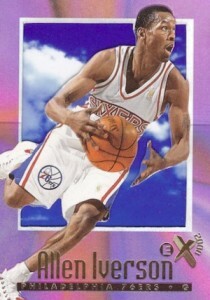 A collecting favorite for many that dabbled in the basketball card market during the 1990s, 1996-97 Skybox E-X2000 is as fragile as it is unique. The cloud background, die-cut image, and iridescent border give it a distinct look, and the white Essentials parallels (#/499) offer a rarity not found among the majority of Allen Iverson rookies. 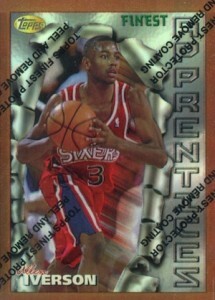 Featuring several different designs for Iverson in the base set, 1996-97 Finest goes big in typical nineties fashion. Apprentices, Sterling, and Heirs are the three themes to include Iverson with the first two featuring a Bronze border and the final card offering Gold. His main rookie is card #69 and the only one found in Series 1 boxes. All three cards are also available as unnumbered Refractors. Presenting another trio of choices, 1996-97 Flair Showcase is elegant and detailed with dual images for Iverson and three different cards. While they are all card #3, the variations come into play thanks to the Rows. Starting with Row 2, each increases in rarity as the number decreases. In addition, there is also a Legacy Collection parallel for every version, which is numbered to 150 copies. The base card is shown for Row 2 and Row 1 below while the Row 0 on the right is the Legacy Collection parallel. 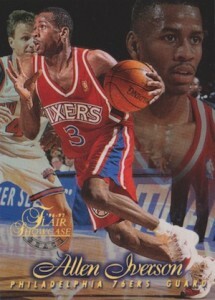 One of the most basic Allen Iverson rookie card options, Fleer is also home to one of the more animated images for Iverson. 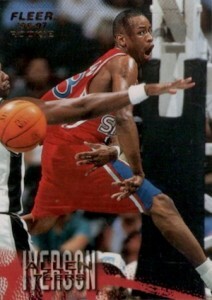 Featuring a wide-opened mouth and no-look pass, 1996-97 Fleer is a cheap add. 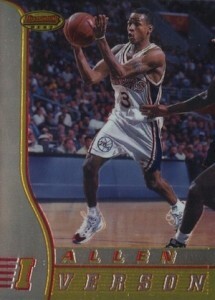 This Allen Iverson card is found in Series 2 boxes of Fleer. Curiously absent from the Fresh Foundation rookie subset in Series 1, collectors had to wait until Series 2 for a base Allen Iverson rookie from Metal. Showcasing embossed letters and a steel background, the card definitely has an industrial feel. Still a year away from their breakout in 1997-98 as Previous Metal Gems (PMG), there is a Previous Metal parallel but it is largely indistinguishable. Screaming out with 1990s style, the playful text and fluorescent highlights give 1996-97 Ultra a very unique feel. 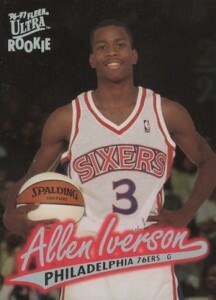 Allen Iverson's rookie is found in Series 1 along with Kobe Bryant and Ray Allen. Limited parallels include Gold Medallion and the very rare Platinum Medallion. As many likely know, Ultra is prone to chipping on the edges. Another very simple release, Hoops is one of the few 1990s brands to still see regular installments in the current hobby. 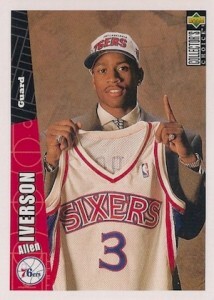 Unlikely to wow anyone with the design or rarity, it fits the bill for a plain Allen Iverson rookie card that can be obtained for very little. 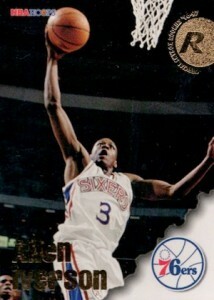 This Iverson rookie is found in Series 2. Looking back now, 1996-97 Skybox Premium appears to have one of few designs that aged well and does not look completely dated. Simple gold foil accompanies a posed photo for Iverson with a clay-like background. The main rookie for Iverson is found in Series 1 and there is also a a more colorful Rookie subset card (#216) in Series 2. A subtle Rubies parallel swaps the foil and is available for both cards. The most over-the-top design of the bunch, 1996-97 Z-Force reminds us how fond everyone was with the letter Z during this time. If you are looking for a wild Allen Iverson card that exemplifies the 1990s and also will be light on the wallet, look to the Z-Force. Although the small 1996-97 SP set is just one of a few to offer a higher-end rookie for Allen Iverson, the card suffers by not being included in the base design. The blue banner just doesn't work, in my opinion, and I would have much preferred the main design with a subtle rookie notation. Another example of the trademark Iverson fire, the base Topps set provides a solid budget rookie that benefits from the obvious similarity to the Chrome version below. 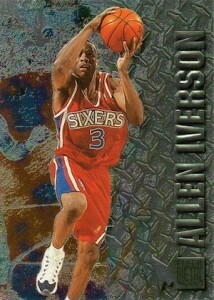 It is important to note that the Allen Iverson rookie card is found in Series 2 boxes. There is also a Chrome-like NBA 50th anniversary parallel but the added logo in the bottom-left corner and lack of Chrome name should make it easy to distinguish. 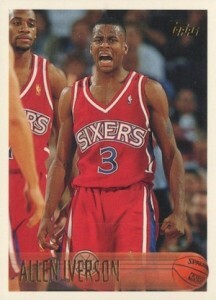 Without a doubt, this is the key Allen Iverson rookie card for collectors. The product's debut edition, 1996-97 Topps Chrome was issued at retail, keeping the overall print run and availability down. Add to that a loaded rookie class and limited Refractor parallels, and it is easy to see why this set still stands tall in the hobby after so many years. A staple of 1990s collecting, Collector's Choice was the main low-end offering from Upper Deck and a great way to get inexpensive cards of the top players. That is still the case and this card is easy to find in the dollar bin. 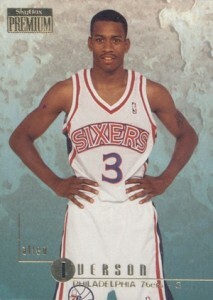 Again, Iverson was part of Series 2. 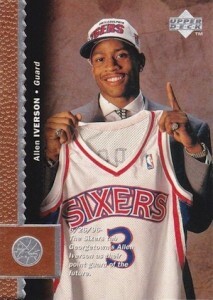 Outside of E-X2000, 1996-97 UD3 is the most original Allen Iverson rookie card available. 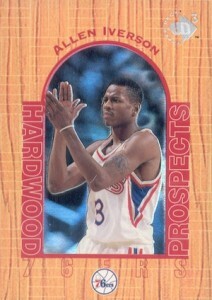 Featuring a faux-hardwood design and foil image, the card offers quality at a reasonable price. 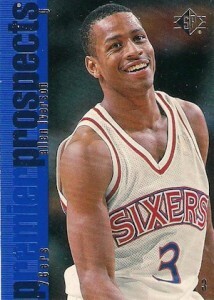 Although it does showcase a similar image to the Collector's Choice card, Iverson's Upper Deck rookie manages to capture a wide smile as well. The set is also home to several inserts for Iverson, including the Rookie Exclusives that have a design reminiscent of basketball leather.